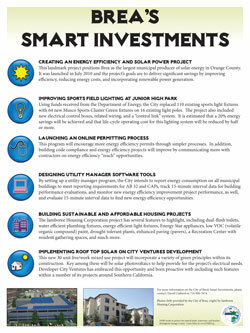 Nine “Smart Investment Case Studies” were released in August 2011. Through the Orange County Listening Tour, the Green Vision Team met with nine different Orange County cities to learn what each city was doing in terms of sustainability. After a two day marathon of meetings, we came away with useful information about investments being made at the local level related to open space, water conservation, waste diversion, green building, online permitting, solar, and so much more. One result of the meetings was the creation of a poster for each city, outlining some of the great savings and investments the cities are working on. These posters were highlighted at the September 2011 Green Vision Workshop. The meetings and posters were made possible due to a generous grant from Boeing.